Here is the legendary Breitling Chronomat 44 in stainless steel, the aviation professional's watch. The case of this watch measures 44 millimeters housing the Breitling Manufacture self-winding automatic movement with 42 hours of power reserve, the case is water resistant up to 200 meters (660 ft). The sapphire crystal features an anti-glare coating and superior scratch resistance, beneath lies a blue dial with bar markers and three black chronograph sub-dials framed with a uni-directional ratcheted bezel. 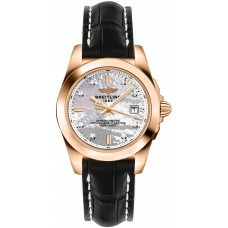 The bracelet is the five piece Pilot style in stainless steel attaching on the wrist with a fold over deployment clasp. 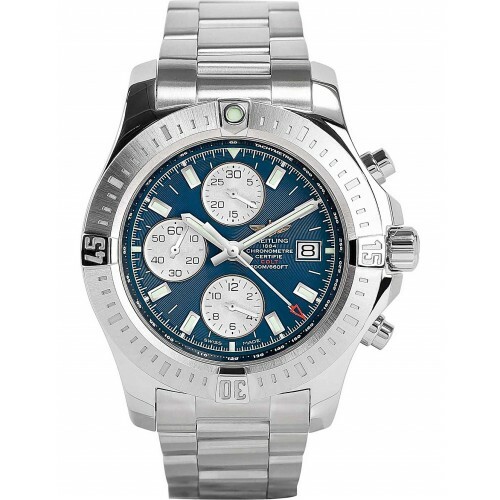 Breitling Galactic 32 Sleek Edition C7133053-C967-408X - Swiss Made, Horizon Blue Dial Set with Diam..
Breitling Galactic 32 Sleek Edition H7133012-A803-780P - Swiss Made, Mother of Pearl White Dial Set ..
Breitling Galactic 29 Sleekt W7234812/A784-791A women's watch. 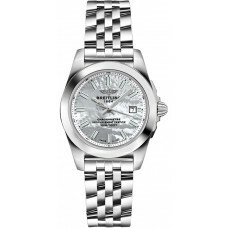 Features a polished stainless steel c..